How can an antenna work when it’s mostly empty space? The same way a fish net catches fish. Look at that antenna up there. There’s a lot of empty space in it, and that might get you a little incensed considering that you have to pay for it. Before you really get riled, though, keep in mind that the antenna would be a lot more expensive if it were solid aluminum from top to bottom, and it would be heavier and tip over in a stiff breeze. The metal starts carrying an electrical signal that matches the radio wave’s characteristics exactly. That’s how you can actually get pictures and sound from radio waves. Different size pieces of metal do a better job with different size frequencies. So what you have with an antenna are some pieces of metal (we’ll call those “elements”) that are just the right size to pick up some radio waves, and some pieces of metal (we’ll call those “reflectors” that block those waves and send them back, so that same element can pick up even more radio waves. Getting back to the first line of the article, the key is to space those “reflectors” out just enough so air can pass through them but radio waves can’t. Remember I said there was a “but?” That’s it. You need to space those reflectors out just right so they block the very frequencies you want. Too far away and those radio waves will pass right through, like a little fish passes through a big net. Why have so much empty space? A big part of the cost of an antenna is shipping. Although you pay a relatively small part of it, there’s all the shipping involved in getting the aluminum to the factory, getting the plastic pellets there, and so forth. Then there’s shipping from the factory to Solid Signal. There’s both an art and a science to minimizing shipping costs. We can package the antenna so it takes up less space in a container. That’s a big part of it. Another big part is minimizing weight. As light as aluminum is, it’s not weightless. It makes a lot of sense to make sure you cut down on weight when shipping companies charge by the ounce. There’s also materials cost to consider, something that’s really come to the forefront lately with changes to international laws. 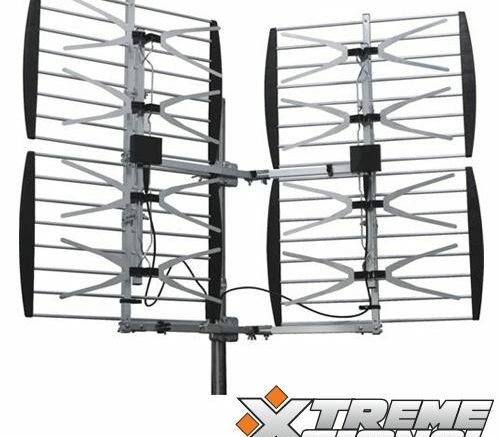 Aluminum costs money so the less you use, the less expensive the antenna will be. That’s another reason that you see not only empty space but tubular construction where the inside of most of the parts is nothing but air. when you’re looking at an antenna, this is the result of a lot of science designed to give you the least possible amount of aluminum (to save weight and cost and reduce wind resistance) and still give you the best possible result. It’s pretty cool all the steps it takes to design an antenna, and at the end of the day you get something amazingly effective, when you realize you’re looking at an HD signal from up to 70 miles away.